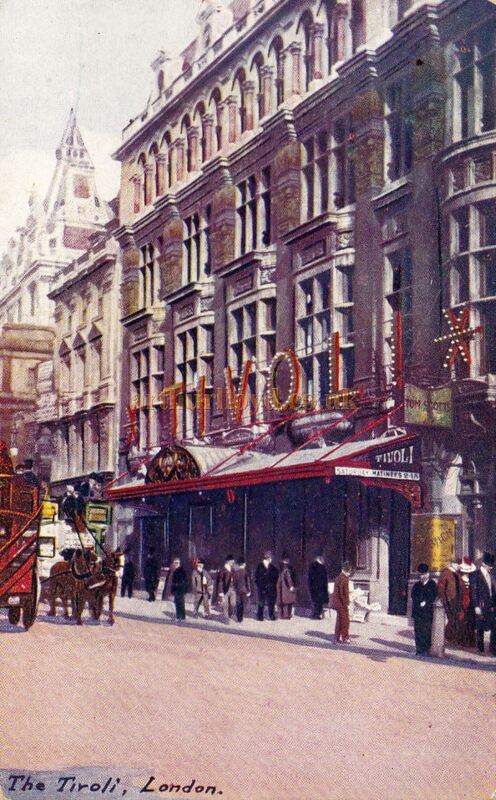 In 1876 a new place of entertainment opened on the Strand in London called the Tivoli Beer Garden and Restaurant. Situated on a site directly opposite the present Adelphi Theatre, the Tivoli Beer Garden and Restaurant was conceived as somewhere to meet, eat, and drink, but it wasn't long before it started engaging comedians and singers to entertain its customers too. Right - A Tivoli Theatre Programme for May the 28th 1892 - Click to see this and many other early Tivoli Theatre Programmes Enlarged. 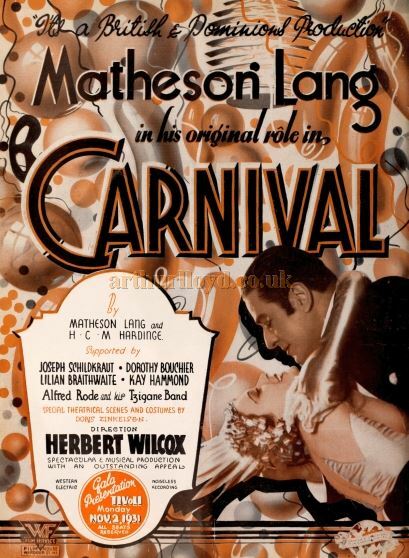 The entertainment element was so successful that it was soon decided that the site should be enlarged and that a Music Hall should be added to the property. Left - The Tivoli Beer Garden and Restaurant can be seen to the left of this photograph taken shortly before its demolition in 1888. From 'The Lost Theatres of London', Mander & Mitchenson. Designs by the well known Theatre Architect Walter Emden were soon produced and on October the 18th 1888 the corner stone of the new Tivoli Theatre and Restaurant was laid. Although Walter Emden designed the building C. J. Phipps is known to have have superintended its construction. 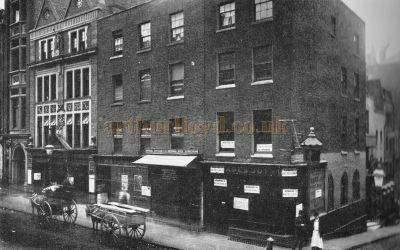 In April 1890, the ERA were reporting on the almost completed building saying:- 'The Tivoli Company's handsome building for music hall and restaurant in the Strand is now nearing completion, and the end of the present month, or beginning of next, will witness its opening. Decoration and fittings are all that remain in the hands of the workmen, and these are so far advanced as to enable one to form a very good idea of the general effect when complete. Of the ornamentation in design there can be but one opinion, and that a distinctly favourable one, while of efficient execution there is already ample evidence. Both restaurant and music hall will contain all the elements of comfort and sightlines which, in places of this sort, go far towards securing popularity with the public. Left - A Tivoli Theatre Programme for November 22nd 1895 - Click to see this and many other early Tivoli Theatre Programmes Enlarged. Entrance to both buildings is from the Strand, but there are excellent exits from the music hall into Durham Street. The entrance hall is spacious and well planned, and of elegant appearance, with its arcade of Indian arches and columns, filled in with arabique. On a level with the street is the balcony tier, which is a point of vantage for a general view of the house. It will here be seen that the Oriental character of ornamentation has been maintained throughout the building, and with admirable effect. An air of compactness and concentration over the stage is a striking feature, while, as a matter of fact, there is a very considerable amount of sitting accommodation as well as good promenading space. There are ten well-appointed boxes on the balcony tier - namely, on either side four small boxes for couples and one large one for four or six. In the area of the hall are a fair number of stalls in front, and an unusually large space for promenaders at the rear. There is a bar 50 ft long at the back, and a small one close to the stalls, both being shut off from the hall itself. The gallery has its separate entrance from the Strand, and an extra exit for use in case of emergency. There is a bar at the back of the circle and a good promenade. There are lounges in abundance, and a good view of the stage from all. The stage is small, but sufficient for the purposes required, and it has an adequate supply of dressing-rooms. The music hall, like the restaurant, is heated with hot water, and will be illuminated by electricity. 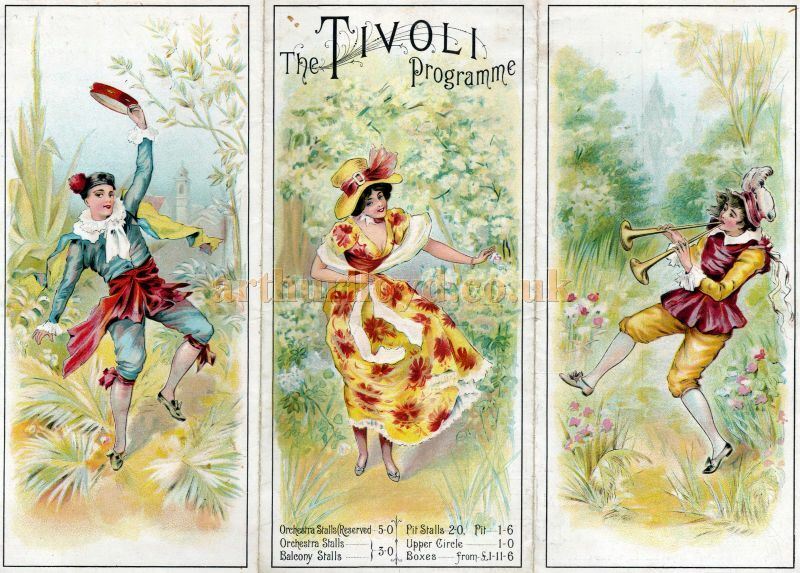 Right - A Tivoli Theatre Programme for the early 1900s - Click to see this and many other early Tivoli Theatre Programmes Enlarged. The restaurant is being decorated and fitted up with unexceptionable taste. The buffet is decorated in Indian style, the wall-space being covered with ornamented tiles of special design, with Algerian marble bar and dado, and elegant panels and intermediate niches with statues of Indian gods and goddesses. The entrance vestibule is in oak panels, and the staircase decorated in the Francois premier order of art. On the first and second floors are the Palm Room and Flemish Room respectively, both being large and elegant apartments; graceful palm leaves being represented on the walls and ceiling of the former, with a very fine dado of marble and alabaster, and inlaid marble floor. The Flemish room is executed in oak, and we hear the whole of the carving was done at the Levant. In this room is a remarkably fine fireplace, which was on view at the Paris Exhibition, and will doubtless command much attention. On the third floor are a series of private dining-rooms, artistically adorned in styles which their names convey - namely, the Louis V Room, the Japanese, the Arabian, and the Pompeiian Rooms; and, in addition, there is a fair-sized Masonic Room. The above text in quotes was first published in the ERA, 5th April 1890. The new Tivoli Theatre of Varieties cost £300,000 to build and duly opened on the 24th of May 1890 but the opening night started with something of a fiasco as the rake in the Pit meant that people behind couldn't see the stage and hundreds of people who should have been seated had to stand, and people in the balcony took to perching on the balcony fronts to get a better view. When people had finally settled down the entertainment began with a welcome from the acting manager, H. F. Potter, followed by an overture by the orchestra directed by Max Maitret. First on the large and varied Bill were Mdlle Bertoto and her transformation dances, followed by Harry Freeman singing 'After Me'; Florrie West then sang 'Who's coming out to play? '; Professor Neiman did a Valentine Vox's Christy minstrel show; a song by Donnell Balfe followed this and then Kate Chard; Tom Costello; the sisters Twibell; Sam Torr; and Ben Nathan all performed their turns to great enthusiasm. This was followed by Chirgwin 'the musical Kaffir', who was not very well so only appeared briefly, much to the audiences annoyance; the Borani Brothers; M'Call Chambers, who would annoy Arthur Lloyd with his plagiarism (see below); the Brothers Armstrong; J. W. Rowley; Jennie Williams; the Bobee Brothers; Florrie Leybourne, daughter of the late George Leybourne; the Brothers James; and finally the Sisters Leyton who danced gracefully but whose singing was apparently not very harmonious. This opening night Bill was carried on for the following week and added even more performers, namely the Sisters Levey, Ella Dean, T. W. Barrett, Tony Ryan, Lily Landon, and Charles Godfrey. However, the new Music Hall, despite the obvious talent on display, was not a success, mainly due to the arrangement of the house itself, where people could barely see the stage from any position and had to stand throughout in order to get a view. 'Sir, - In your critic's notice last week of the opening of the Tivoli he referred to one of the company as giving an imitation of various dancers he met at a ball. On making inquiries I find this to be a wholesale appropriation of my original business which I created in my well-known "Polka" song, which I have been singing for the last seven or eight years. Everyone who knows me will acknowledge that I have been always one of the first to encourage talent in beginners, but when they bodily annex the entire business and style of a popular song belonging to a well known artiste, I think they should be immediately checked by public, press, and proprietors. I have all through my career been a staunch upholder of originality, and nothing annoys me so much as to see dead copies of popular songs and artists, who work hard to get original ideas. To all such copyists I give this advice, that to make any headway or popularity in this profession (that is, lasting popularity) an artiste must be original and have a style of his own, not a copy of one or a mixture of half-a-dozen others. Yours, &c., Arthur Lloyd.' - From the ERA 1890 - Courtesy John Grice. 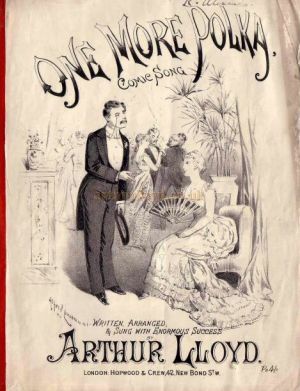 Arthur Lloyd is known to have performed at the Tivoli Music Hall himself in its opening year of 1890. By April the following year the Theatre had been put up for sale by auction but failed to reach its reserve price. The Theatre was subsequently closed on the 20th of June 1891 and the renowned Theatre Architect Frank Matcham was brought in to remodel the building. Charles Morton took over the management of the Theatre for its reopening on the 4th of July 1891. The ERA reported on the new Tivoli in their 4th of July 1891 edition saying:- 'A wonderful transformation has been accomplished here by that well-known and popular theatrical architect Mr. Frank Matcham, and the habitues will hardly know the place again, so greatly has it been improved in its internal features, and so judiciously has it been re-decorated. 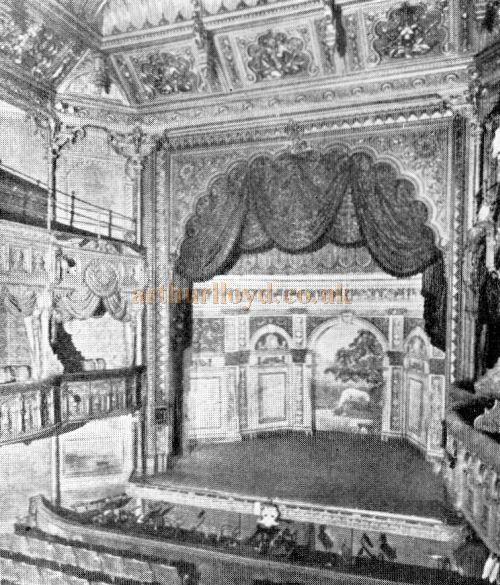 Right - The auditorium and stage of the Tivoli Theatre after its Matcham remodeling of 1891 - From 'The Lost Theatres of London', Mander & Mitchenson. Mr. Matcham has managed, by a few judicious alterations, and without interfering with the structural parts of the building, to very greatly improve the view of the stage from all sections of the house. The ventilation of the building has also been greatly improved, as Mr. Matcham has introduced a handsome sunlight of novel and effective design in the centre of the auditorium ceiling, from which a large foul air extract is carried outside the building. The electric lighting has been re-arranged, and a very complete scheme is the result. The lights are now distributed over the centre and sides of the ceiling, and are introduced in a very novel and effective way in the gallery and balcony fronts. Turning to the decorative features of the interior, it will be seen that considerable additions have been made to the fibrous plaster finishings and ornamentations, and that an effect of lightness and space has been gained by handsome mirrors on the walls. Use has been made of artistically designed and well-executed friezes and panels to heighten the general effect, and the whole of the auditorium has been re-decorated in gold and colour of a lighter and less severe style than before, the panels in front of the balcony ceiling being especially noticeable for their beautiful and artistic treatment. The entrances and saloons have been also thoroughly redecorated, but in different styles from the rest of the building - the balcony saloon being in Louis Quinze style, and the stalls saloon in Japanese. A special feature has been added by the introduction of a new arch over the proscenium opening, of Indian character and striking design. The whole of the interior has been entirely re-upholstered and re-furbished with luxurious carpets, tip-up seats re-covered with plush, artistically draped curtains and valances fixed to the boxes and principal entrances; the stage opening fitted up with handsome plush tableau curtains. The above text in quotes was first published in the ERA, 4th of July 1891. The opening night Bill for newly remodeled Tivoli Theatre on the 4th of July 1891 included Effie Chapuy, Fred Harvey, Ada Reeve, George Beauchamp, Josephine Henley, Charles Godfrey, the Two Macs, Minnie Thurgate, Albert Chevalier, Ida Heath, the Brothers Horne, Jenny Hill, Prince Mignon, Kara, Herbert Campbell, Fannie Marriott, Tom Costello, J. W. Cheevers, the Eltons, Alice Maydue, Dutch Daly, the Sisters Jonghmanns, Parker's performing dogs, and Revene and Athas. Above - A Tivoli Theatre Programme for the early 1900s - Click to see this and many other early Tivoli Theatre Programmes Enlarged. Matcham's alterations seem to have done the trick and the new Tivoli Theatre was far more successful, and looking at various programmes from the 1890s and 1900s all the major stars of the time appeared there. In 1893 Vernon Dowsett took over as the Manager from Charles Morton who had reopened the Theatre two years earlier in 1891. In 1910 the buffet and the restaurant were merged into the Theatre making for a larger and grander vestibule and entrance hall. The Grand Circle saloon was also redecorated at this time in the Louise XVI style. Perhaps surprisingly the Theatre's original architect Walter Emden was in charge of the design for this work. Despite the success of the new Tivoli Theatre, in February 1914 it was closed for a proposed road widening scheme. Plans were drawn up for a replacement Music Hall but the war intervened and the plans were abandoned. Meanwhile the Theatre fell into disrepair and was left derelict for several years and then demolished in 1916. After the war it was decided that a replacement Music Hall was no longer viable and the site was cleared, the Strand was then widened to its present size, and a new Cinema was then built on the site called the Tivoli Picture Theatre (see below). The new Tivoli Picture Theatre was designed by Bertie Crewe and Gunton & Gunton, for a Company Chaired by James White, and leased to Metro Goldwyn Meyer. 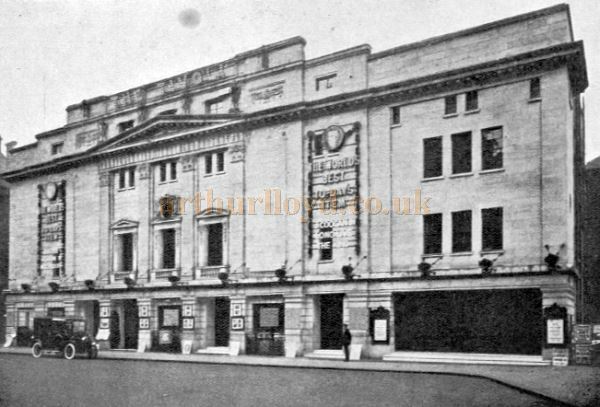 The Theatre, which opened on Friday the 7th of September 1923, was on a vast scale and covered the whole site of the former Music Hall and Restaurant. Little Titch, Kirkby Lunn, Malcolm Scott, and Marie Dainton, all appeared on the new Theatre's stage for the opening night and were followed by a showing of the film 'Where the Pavement Ends'. Right - A Programme for the Tivoli Theatre for February the 21st 1927 with the moniker 'The Home of Celebrity Vaudeville'. The Times Newspaper reported on the new Tivoli Theatre in their August the 13th 1923 edition saying: - 'The new Tivoli Picture Theatre, which has been built in the Strand on the site of the old Tivoli Music Hall, is to be opened to the public on Friday, September 7. An arrangement has just been made by Mr. James White and with Sir William Jury and Mr. Marcus Loewe, the chief of the American film-producing organisation, the Metro Company, by which all the biggest pictures of this company are to be shown in London exclusively at the New Tivoli Theatre. 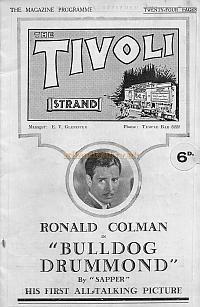 Left - A Programme for 'Bulldog Drummond' at the Tivoli Cinema, Strand on September 16th 1929. A beginning will be made on September 7, with Where the Pavement Ends, a "Metro" film produced by Mr. Rex Ingram, who was responsible for The Four Horsemen of the Apocalypse. 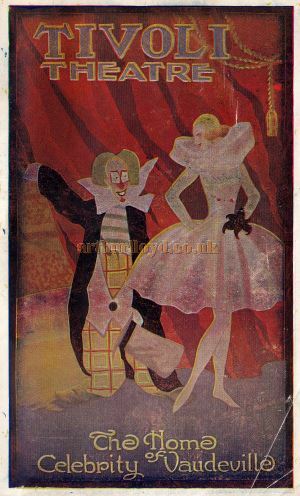 This will probably be followed by Scaramouche, based on Mr. Rafael Sabatini's book Ambrose Applejohn's Adventure, Long Live the King (with "Jackie" Coogan), and The French Doll. The above text in quotes was first published in The Times, August the 13th, 1923. 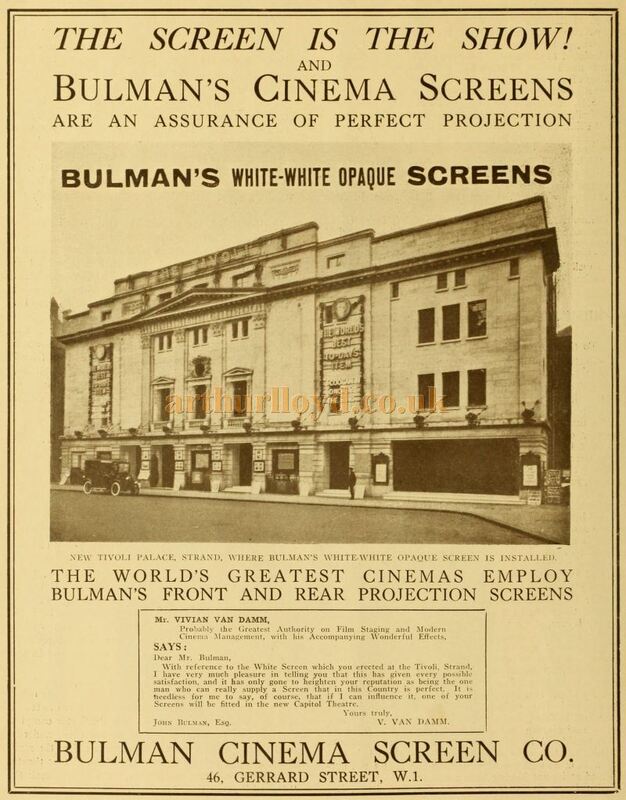 Above - An Advertisement for The Bulman Cinema Screen Company, as fitted at the Tivoli Picture Theatre, Strand - From the Supplement to The Cinema News and Property Gazette of January 8th 1925. 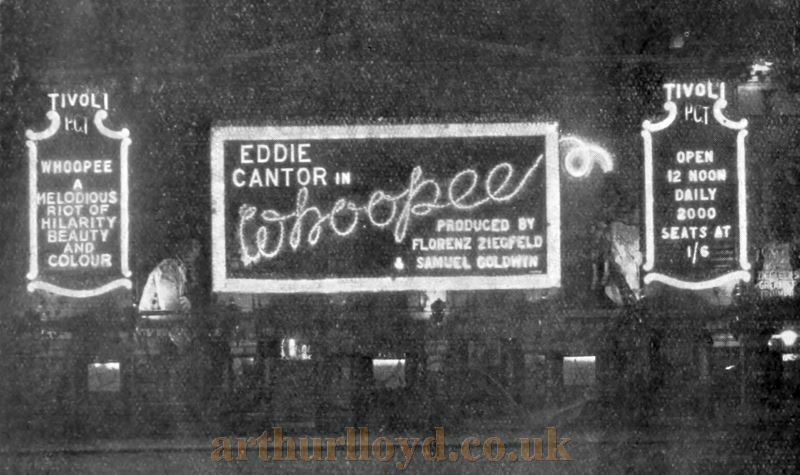 Above - The Tivoli Theatre at night showing neon sgns for Eddie Cantor in 'Whoopee' - From 'The Bioscope' November 1930. Above - The Tivoli Theatre showing the film 'Carnival' (Original Title 'Venetian Nights') in 1931 - From the Bioscope, 11th of November 1931. 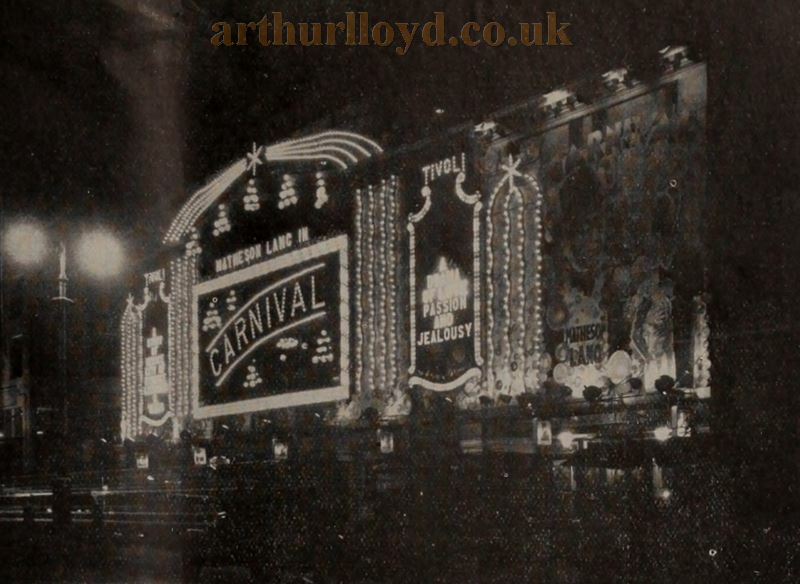 The caption for this image reads 'Illuminated balloons filled with hydrogen, together with a display of colour in the true "Carnival" spirit, form the basis of the attractive display on the Tivoli front to interest the public in the W. & F. picture of that name. Since Jeffrey Bernerd assumed control of the G.B. West End group, showman stock has gone up appreciably, and Manager W. P. Fisher deserves praise for the manner in which he has here co-operated with his chief'. 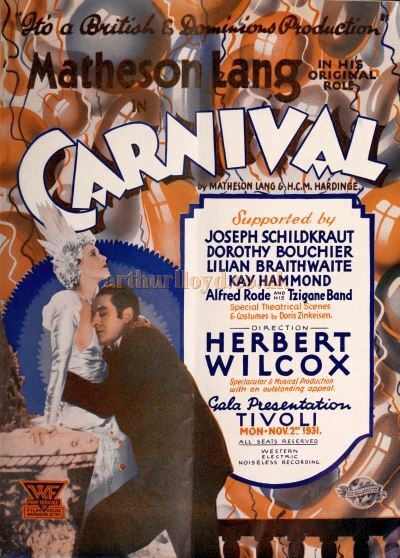 Above - Two Posters for the film 'Carnival' (Original Title 'Venetian Nights') showing at the Tivoli Theatre in 1931. 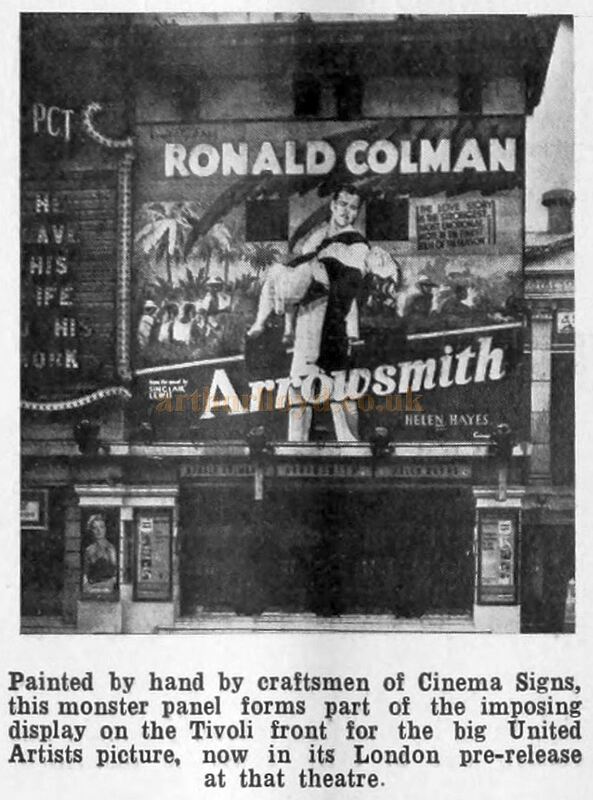 Above - An advertising sign for Ronald Colman in the 1931 film 'Arrowsmith' on the Facade of the Tivoli Theatre in 1932 - From the Bioscope of April 1932. 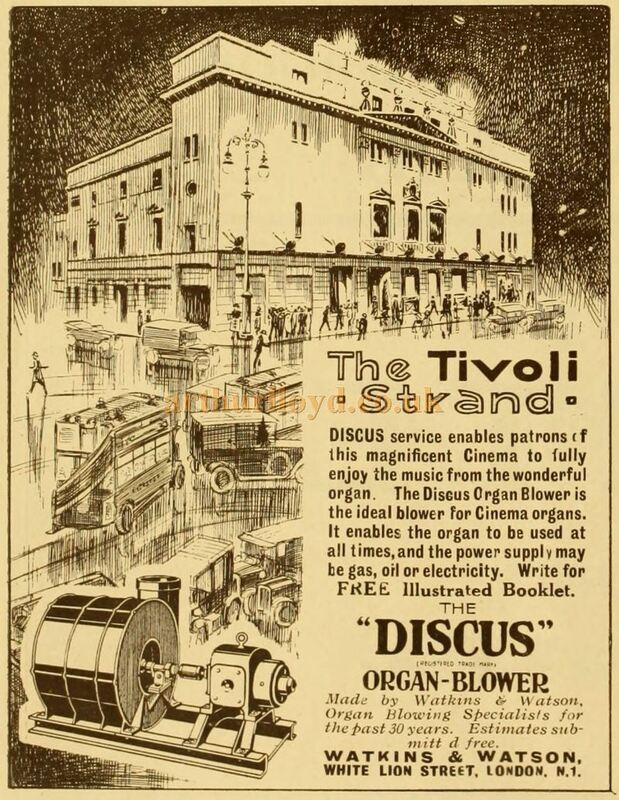 Above - An Advertisement for the Discus Organ Blower as fitted at the Tivoli Picture Theatre, Strand - From the Supplement to The Cinema News and Property Gazette of October 2nd, 1944. On the 30th of September 1939 the Tivoli closed to the public due to the outbreak of the war earlier in the month, and in 1941 the Theatre suffered serious bomb damage during the blitz, but although it was no longer open, its basement areas were used as air raid shelters on occasions. The Theatre wouldn't reopen to the paying public until the 22nd of February 1943 when it showed the premier of the Tommy Handley film 'It's That Man Again'. The Tivoli then remained open for the rest of the war, showing first run features. 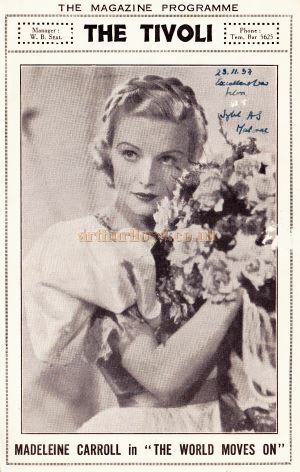 Right - A programme for 'The World Moves On' at the Tivoli Cinema in November 1937. In 1944 a memorial plaque, or tablet, celebrating the work of Marie Lloyd, who often appeared at the Tivoli, was unveiled in the Theatre's foyer, (more information on this can be seen below). 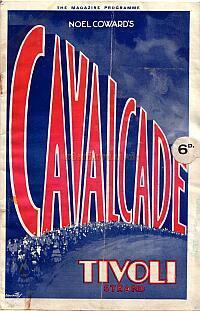 Left - A Programme for 'Cavalcade; at the Tivoli Cinema, on May the 8th 1933. 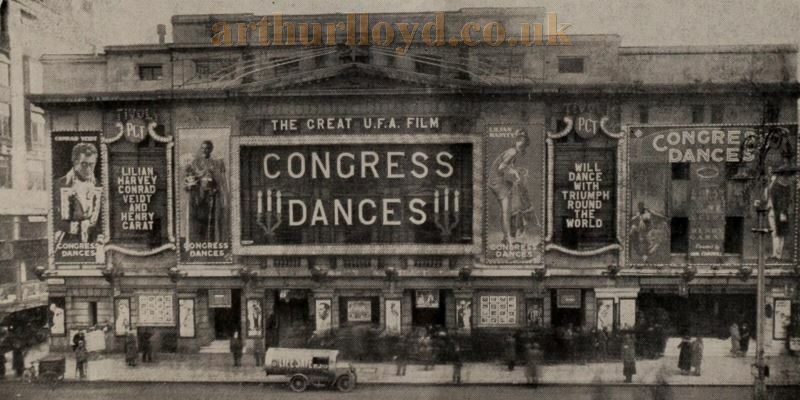 In the early 1950s the Theatre was run in conjunction with the Astoria Theatre on Charing Cross Road where they both played ABC's pre release films. The Tivoli Theatre finally closed on the 29th of September 1956 with a last showing of the films 'The Baby and the Battleship', and 'Oklahoma Woman'. The following year, 1957, the Theatre was demolished to make way for a branch of the Peter Robinson Fashion Store. 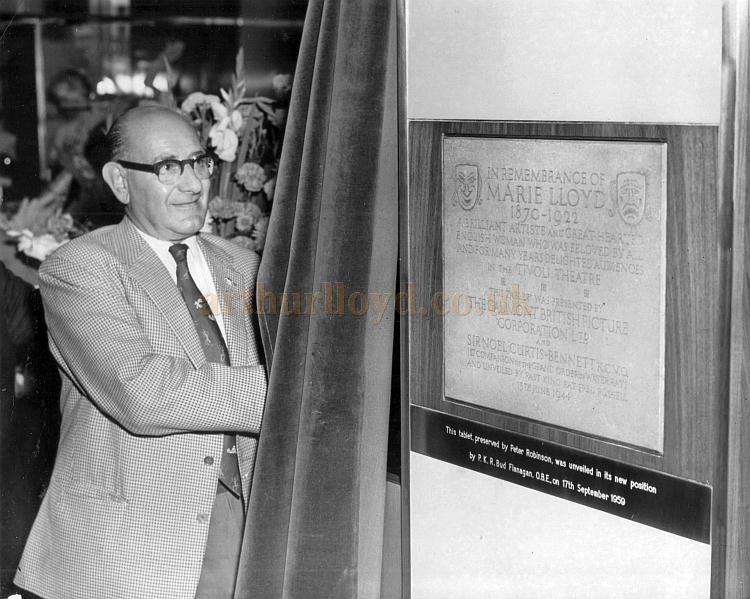 The Memorial plaque to Marie Lloyd, which had originally been placed in the Picture Theatre's foyer in 1944, when it was being run by Gaumont British Picture Corporation, was repositioned in the new Store after it opened in 1958, and was unveiled by the much loved singer, music hall star, and member of the Crazy Gang, Bud Flanagan on the 17th of August 1959 (shown below). Above - Bud Flanagan unveils the Marie Lloyd Remembrance Tablet from the Tivoli Theatre at the new Peter Robinson Store on the Strand on the 17th of August 1959 - A Sport & General Press Agency Ltd. Photograph. Sadly the Tablet was later found in a skip, broken into four pieces, and was given to the the British Music Hall Society by a member of the public, see photograph below. 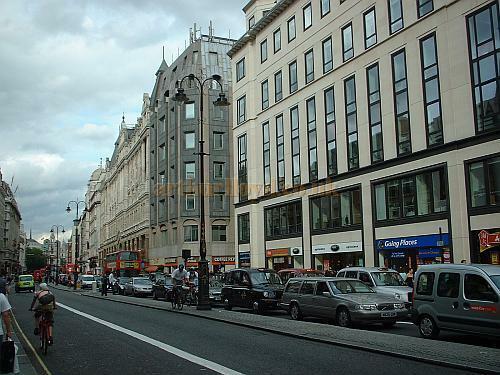 Right - The Strand in 2003 - The building on the right stands on the site of the Tivoli Theatre, and also on the site of 71 The Strand where Horatio Lloyd's father Robert Lloyd worked as a Hatter, and where Horatio himself was born, opposite the Adelphi Theatre. Horatio Lloyd was the father of Arthur Lloyd. There are some photographs of the Peter Robinson Store on the Strand here, and here. The store was later converted by the Australian Government into their 'New South Wales House'. This has also now been replaced, and today offices and shops now stand on the site, which can be seen in the photograph shown right. 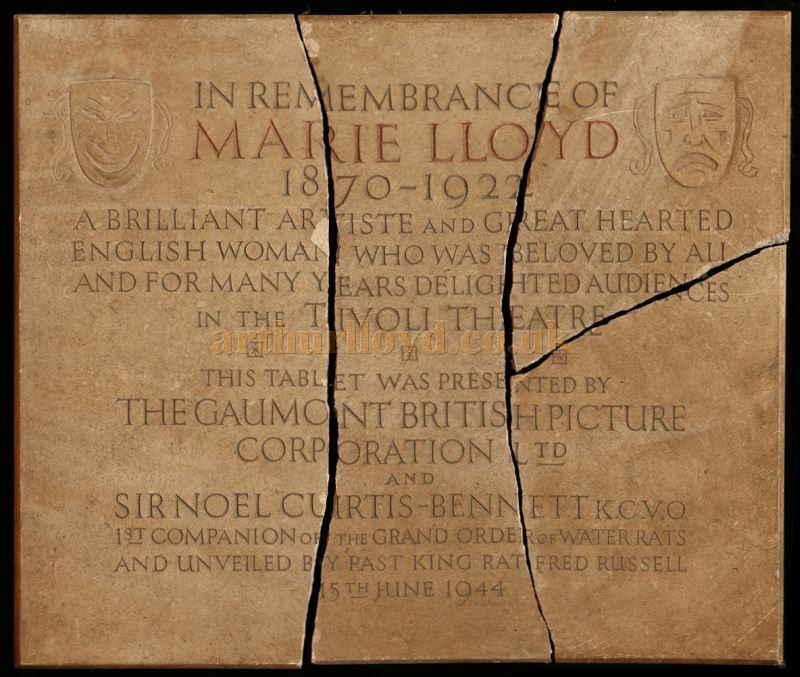 Above - The Marie Lloyd Remembrance Tablet from the Tivoli Picture Theatre, here shown broken into four pieces where it was found unceremoniously dumped in a skip and saved by a member of the public who handed it over to the British Music Hall Society. Photo Courtesy © The Andy Hollingworth Archive. 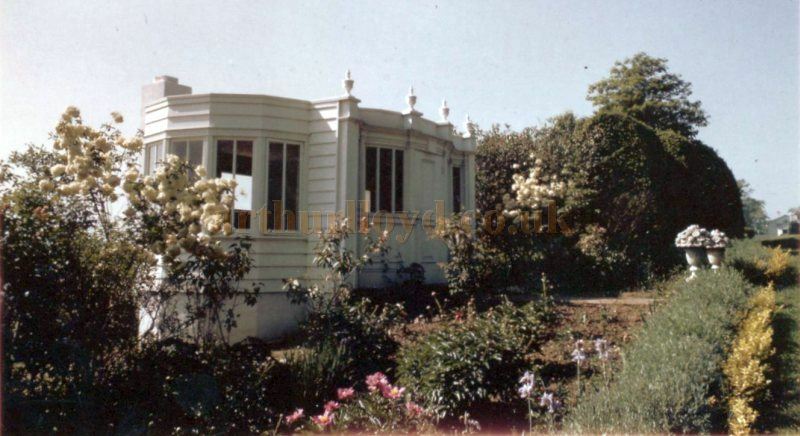 Above - The summer house in the Ladew Topiary Gardens, Monkton, Maryland in the 1960s - Courtesy Ladew Topiary Gardens. The facade of the Tivoli Theatre's Ticket Office is said to have been transported to America by a Mr. Ladew where it found a new home as a summer house in what is now the Ladew Topiary Gardens in Monkton, Maryland. It is thought that the Facade is from the original Music Hall, which first opened on the 24th of May 1890, and was demolished in 1916. Christopher Weeks book about Mr. Ladew says that when he heard that the Tivoli Music Hall was going to be demolished, he arranged to have the ticket office's wooden facade moved to his gardens in America. Mr. Ladew was a huge Anglophile and he hunted in England for 21 consecutive seasons. Many of the furnishings in our Manor House reflect his travels and love of England - Fran Scully 2014. Above - The Tea House in the Ladew Topiary Gardens, Monkton, Maryland today - Courtesy Ladew Topiary Gardens. 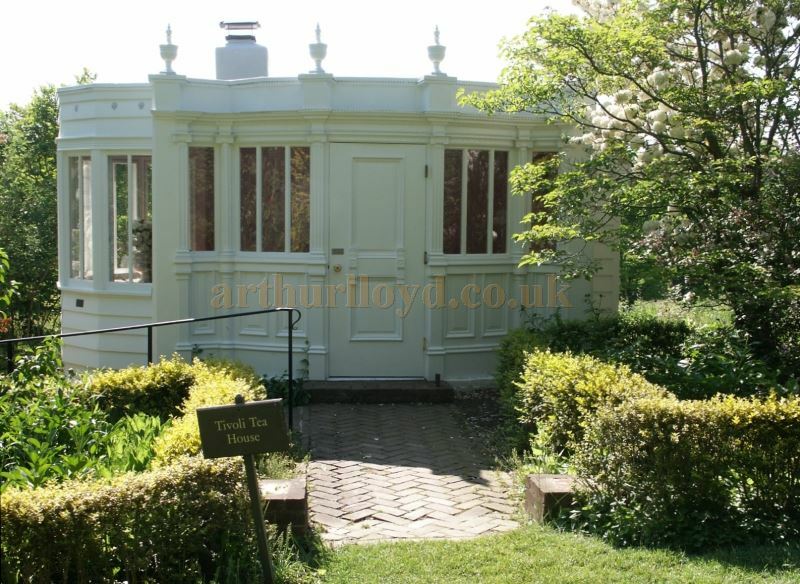 The above information and photos of the Tivoli Tea House are courtesy Fran Scully and the Directors of the Ladew Topiary Gardens who would be pleased to hear of any more information on, or confirmation of, the Tivoli Theatre's Ticket Office becoming their Summer House. If you can help please Contact me.